My request for a driver to take the precious dharma teachings we have archived all these years at our center (Heart Center KTC) to KTD monastery has been answered in the form of Troy Wehner, a filmmaker from Royal Oak, Michigan. And thanks to Amy Schwartz for pitching in on the gas money! Troy will spend some time at our center and then head out across the country through the autumn foliage to visit both Karmé Ling (our three-year retreat center) and Karma Triyana Dharmachakra Monastery (KTD), leaving sections of the taped teachings in each place. Thank You Troy! I have the boxes all packed. All I have to do is tape them shut and they are ready to go. The former "tape room" is now being converted into what amounts to the equivalent of a tack room for audio equipment, scores of cables, wires, microphones, and all that kind of stuff, not to mention various guitars and what-not – everything finally in one place. Meanwhile I continue to work in the studio, bringing it up to date with new equipment. For example, yesterday I replaced our aging bays of connectors with state-of-the-art Neutrik patchbays, carefully plugging in hundreds of wires into (I hope) the correct receptacles. I also updated the three Mac computers in the studio with as much RAM as they can take and loaded two of them with recording and mixing software... things like that. In this new version of the studio we will have both an isolated control room and the ability for the recording engineer to setup in the large live room (formerly the library) and work from there. Revamping the studio is a slow, but fun, process and I try to do a little every day. I plan to show pictures here once I get near-done with the project. When Lama Karma was here last weekend, he walked through the studio and consecrated the place, scattering blessed rice as he went. This is not the first time the place has been blessed. Many lamas have been there, including His Eminence Tai Situ Rinpoche and of course our main teacher the Ven. Khenpo Karthar Rinpoche. I am working to complete what will be a mandala for recording music in am organic environment. So far, so good. Meanwhile, as you can see from the photo, Emma has taken almost complete control of our place. 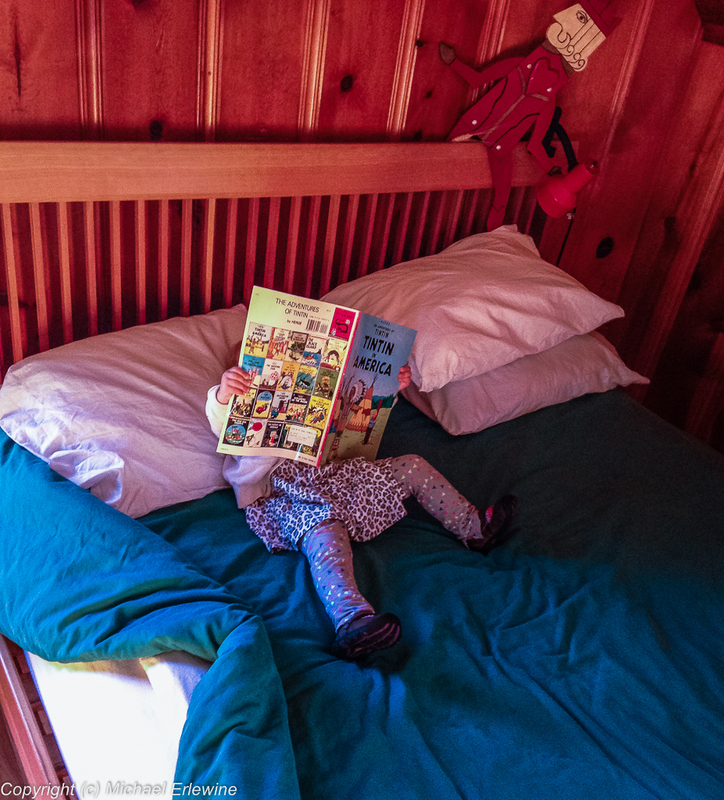 Here she is up in what was my son's bedroom reading a comic book. Well, reading is not the word, but she is looking at the pictures and commenting. Her mom Anne took this picture. Speaking of Anne, who is an artist…she is setting up shop here and producing some great paintings these days. I will show some of them soon on this blog. People are buying them and they are so nice. Having Anne and Emma here is so much fun. Last night we all watched part of a movie together and had popcorn, apple slices, and bits of cheese. Emma insists each night we do this in dragging a pillow (larger than she is) up on the coach, so she can have her own special backrest. She pulls the blanket up to her chin, just like grandpa. Emma and I have our laughs. Living with a 21-month old child in the house is nuts too, plunging Margaret and I into the past and near destroying the fragile composure of the house. Kids stuff is, as you might imagine, everywhere and when I get up in the middle of the night (as I am now) I have to shuffle my feet across the floor in the dark lest I step on something and break it or my foot. Having Emma and Anne's dog Lukah here is also a trial of its own. Just try walking two dogs on those long expandable leashes when neither has any training. Now that is a true test in patience, when all I want is a relaxing walk. Good luck in that. Anyway, I am learning that there is no choice but to abandon myself to the impending chaos and bask in the sunshine of little Emma and her mom. As they say "It's all good!"